Ideal for students and businesses, this Dictionary for iPhone and iPad lets you translate words and phrases and conjugate verbs in an instant. So many more features than your average dictionary. Mobile Dictionary for iOS devices converts your iPhone or iPad into a dictionary device that goes everywhere you do. Consult dictionaries, and conjugate verbs in five different languages without missing a beat in your busy schedule. iOS Offline Dictionary is compatible with most iPhones and iPads running the iOS operating system. It takes years to master just one language. The biggest challenge for most language learners is verb conjugation. Our iOS Dictionary software does the work for you in record time, providing conjugation and translation in an instant. You get English, French, Spanish, Italian and German... all in the palm of your hand. Conduct business, negotiate deals, and exchange messages in languages you don't speak. Travel to foreign countries and communicate in their language. Connect with friends, relatives and colleagues around the world. Stuck for a word or phrase in a foreign language? Mobile Dictionary for iPhone and iPad gives you on-the-spot help. The iOS Dictionary lets you read websites and other documents in another language, no matter where you are... in the car, bus, train or plane. Between classes or meetings. Between home and work. Anywhere, anytime. Search for words or phrases using built-in translation dictionaries. Select source language and target language. Conjugate verbs in five different languages. 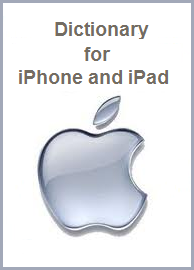 *iOS, iPhone and iPad are registered TradeMarks of Apple Corporation.